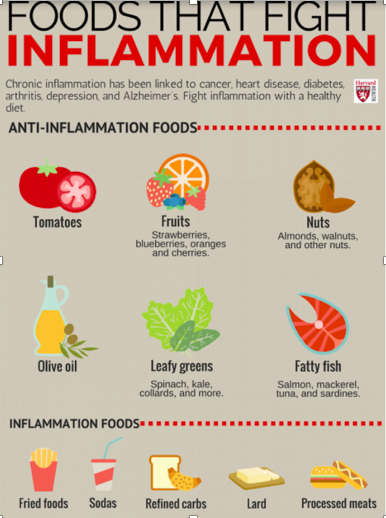 This great pictogram from Harvard Medical School gives a wonderful snapshot of foods that help reduce inflammation in the body. And, it seems to make sense right? Everyone knows a burger and chips is bad for you and kale is king (obvs). But if you look closely, the common denominator above is that none of these foods are processed (apart from the olive oil). You pick, you catch, you cook, you eat. On a broader scale, it got me thinking about the components of our meals. Just what exactly are we eating? How much ‘stuff’ has been done/added to it? Should we just move to the woods and forage off berries??? 1. Did this come from a packet? I’m not talking about cellophane wrapped veg that plagues supermarkets and drives Plastic Anxiety. Rather I mean food that has been processed, packaged, packed and put on shelf; that ‘healthy’ breakfast cereal bar is unlikely to be as good for you as a bowl of oats. 2. What was done to this before it got to you? In general, the less the better. 3. How many ingredients are on the back of the pack? Do you recognise them? When it starts reading like the cast of a sci-fi, chances are you’re better off without. This visual got me thinking of a traditional Bengali diet. And no, I don't mean the biryanis and ladoos (deep fried sugary sweet treats) that adorn celebrations and feasts. Rather, the simple meals of my grandparents’ time. Meals would be homecooked and generally consist of a small amount of rice, along with cooked vegetables, salad, fish and occasionally meat. If I conjure up an image of what it would look like, I'd say it'd closely resemble a rainbow. The yellow turmeric of lentils, steaming white rice, emerald green veg and silver slivers of freshly caught fish. Perhaps this is what I should be aiming for on a day to day basis. Unprocessed, home made, fresh food. So yesterday, when I found myself wanting to tear open a packet of salty deliciousness on the way home from work (I’m talking to you, you Hula Hoopy tease), I bought some mixed nuts instead. The verdict? I would have enjoyed the Hula Hoops more, let’s not pretend. But the nuts were pretty good too and there was an added bonus: ever since I discovered cashew nuts in my Chinese chicken curry at the age of 11, to this day I still feel the same joy when I unexpectedly stumble upon them - even when it’s just finding a few hiding in a bag of mixed nuts from the corner shop.